Wood Floors & Bathrooms: They Simply Don't Mix ! Wood floors have seen a huge resurgence in the last two decades. After linoleum and tile took over in 80s and 90s, wood floors came back with a bang. Wood floors make for a stunning look. They’re timeless, classic, and beautiful. They can look better with age, and usually last a long, long time. Unfortunately there are a few drawbacks of a wood floor, and today we’re talking about the most concerning one. Wood floors and bathrooms simply don’t mix. Few people are choosing wood for their bathrooms, but the problems we see are usually when they felt they didn’t have a choice. Wood floors are the most popular option for the main floor of a home. It looks expensive and impressive, so it’s the natural choice for an entryway, foyer, and your main living spaces. Your main level bathroom. Often homeowners invest in wood flooring on their entire main level. This can include your main floor bathroom or powder room. Some homeowners don’t see a need to cut around that room and buy a secondary material for a bathroom. They have concerns about cost and continuity. Water. Wood, even well done and properly sealed, can have serious problems with water. Moisture and water residue can cause warping, discoloration, expansion, staining, and more. If your bathroom features a shower or bathtub, the risk increases. Even if it’s just a powder room, your floor will not escape the natural dripping and occasional overflow of toilets or sinks. Over time, you’ll notice warping and pulling at the edges of your wood floor. You’ll see water marks and other discoloration. Eventually you will face expensive replacement or repairs. The answer is simple – anything BUT wood. Tile has long been a popular choice for bathrooms because of the water-resistant, easily cleaned nature of the stone. Linoleum, vinyl plank flooring, and other manufactured options have water-resistant features that make them economical as well as long-lasting for a bathroom with moisture problems. If you have wood in your bathrooms, do your best to keep it as dry as possible. As soon as you see staining or warping – give us a call. 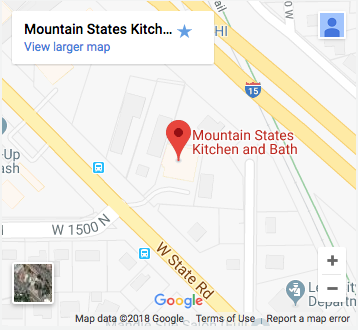 At Mountain States Kitchen & Bath we can show you modern updates that will work well for your bathroom without breaking up the continuity of design. When it comes to your bathroom, let us steer you away from wood and to a more water-friendly option.